With UIKit Dynamics you can specify collision behaviours to your objects. The dynamic items can collide with each other and/or any boundary you specify. In this tutorial we will create some custom boundaries and randomly let some squares fall down on to these boundaries. This tutorial is made with Xcode 10 and built for iOS 12. 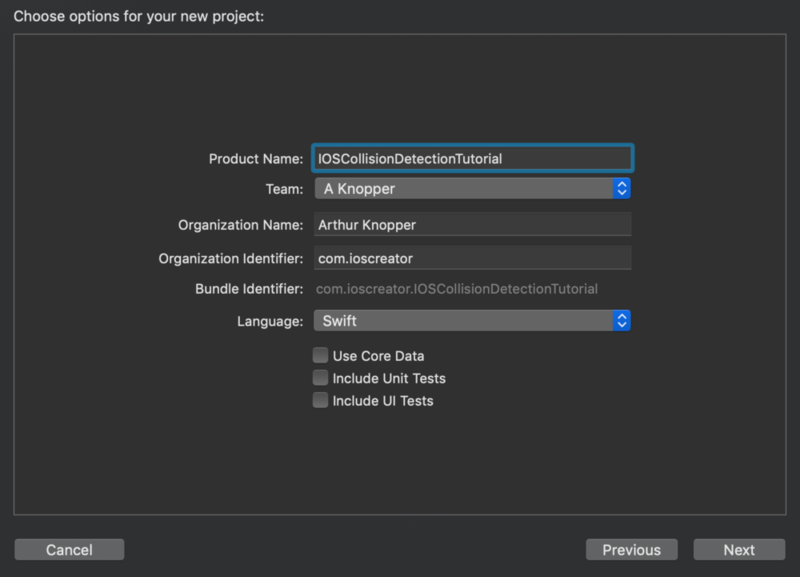 For product name, use iOSCollisionDetectionTutorial and then fill out the Organization Name and Organization Identifier with your customary values. Enter Swift as Language and choose Next. To draw some lines a custom UIView will be used, where the drawRect method will be altered.. Select File -> New -> File -> iOS -> Source -> Cocoa Touch Class. Name the class LineView and make it a subclass of UIView. We make three calls to our helper function creating three lines of the same width with different heights. We need to connect our MyView to the view controller. Go to the storyboard and select the main view. Go to the Identity Inspector and change the class to LineView. Build and Run the project, the Lines are drawn on the screen. Next, drag a button to the Storyboard and give it a title of "Next". Select the Resolve Auto Layout Issues button and select Reset to Suggested Constraints. Select the Assistant Editor and make sure the ViewController.swift is visible. Ctrl and drag from the Next Button to the ViewController class and create the following Action. These properties are needed to set our custom boundaries and add a starting point for our squares. First, create a helper method setBoundaryValues to set these properties. In viewDidLoad, we will call our helper method and set the remainder of the square values. So, every view has a size of 50 and can be of 5 different colors. The main flow of our project happens in our releaseNextSquare(_:) IBAction method. First, we add a gravity behavior to our animator to let our squares fall. Next, a collision behaviour is added with our custom boundaries. This behaviour is also added to our animator. The default collision mode of UICollisionBehaviour is UICollisionBehaviourMode.everything, which means that all items and boundary can collide with each other. Build and Run, and keep pressing the Next button to let the squares fall down. You can download the source code of the iOSCollisionDectectionTutorial at the ioscreator repository on Github.